In Store & Online: To redeem in store, show mobile coupon at checkout or give printed coupon to cashier. To redeem online, enter promo code GET20OFF at checkout. Printable Coupon: $10 discount on any Pampers or Huggies value box of diapers regularly priced 42.99 ea. Printable Coupon: Must be surrendered at time of purchase in Babies R Us stores. Only original coupons accepted. Valid USA only. Printable Coupon: Get a free bottle & pacifier with any $25 purchase or more. Choose from 2 designs a $7.99 value. Print coupon and get 20% off your total purchase of nursery furniture over $699. - 20% off bassinets, play yards, high chairs. - 20% off bouncers, walkers, jumpers. - 20% off regular price car seats. - 20% off stroller and travel systems.. Exclusive Coupon: Get a 15% discount on one regular priced item. Excludes baby food, diapers, formula, wipes.. To use this coupon online enter coupon code: BONUS15 at checkout. Print this babies r us coupon for a 20% discount on clothing, shoes and accessories. Print or show coupon on your smartphone. Print or show coupon on your smartphone. Get a free $10 Babies "R"Us Gift Card With your purchase of $75 or more. Get a free Paw Patrol 9-oz. Insulated Straw Cup (6.99 value) with any purchase of $25 or more. Print coupon and get 15% off one regular priced item. Print this babies r us coupon for a free disney mickey or minnie 9oz Christmas cup ($5.99 value) with any $20 purchase or more. Print coupon for a $8 discount on all Pampers & Huggies boxes of diapers. Print coupon for a 20% or 10% discount on graco car seat and travel systems. 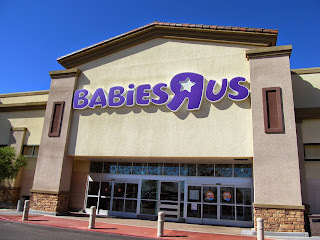 Print this Babies R Us coupon for a 25% discount on all partyware, greeting cards, gift wrap, gift bags, bows, party favors, pinatas, party accessories, balloons and candles. Redeem coupon at register. Print coupon and receive Koala baby creepers and rompers for only $5 each. Valid at your local Babies R Us store.